Either in ignorance or denial of American Indians' extensive alteration of the North American environment, Captain John Smith noted that while other continents were "beautiful by the long labor and diligence of industrious people and Art. This is onely as God made it." 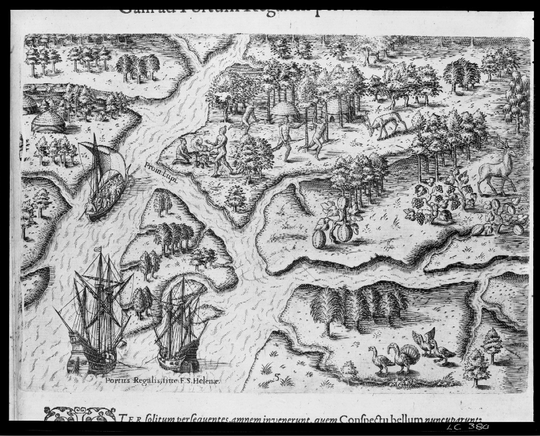 This illustration of the Carolina coast features objects of nature native to the Americas that intrigued Europeans, including the continent’s dense forestland, the plentitude of wild game, such as deer and turkey, and, in the center of the picture frame, the pumpkin. The artist Theodor de Bry’s depiction of a pumpkin mimicked Fuch’s Cucumis turicus illustration, suggesting that de Bry did not base his drawing on firsthand observations but instead on Fuch’s botanical drawing. The pumpkin was the symbol of the land's lush vegetation and natural resources, though many believed the continent to be "a rude garden," as another colonial source remarked, nonetheless.